Update: A second LG G6 photo has been leaked, showing the phone in full, and we've added it below this story. The story in its original form continues below. A lot can change in a year and the LG G6 is shaping up to look very different from the LG G5 in the lead up to its official unveiling next month. We're seeing what looks to be the first official LG G6 photo, or at least the top of the phone, thanks to a leak obtained by The Verge. It shows the front and and left side of the Android Nougat smartphone and there's a distinct lack of bezel around the screen. We already know that it'll boast a large 5.7-inch screen and a very unique 18x9 resolution, as confirmed by subsidiary LG Display. Other expected LG G6 features include a waterproof design and dual-rear camera lens to capture wide angle photos. But you'll have to do without modular accessories (everyone is okay with that) and a user-replaceable battery (that's going to ruffle some feathers). The LG G6 puts greater focus on design than the the LG G5, which tried to push a modular accessories gimmick that went nowhere. Its 5.7-inch display, novel 18x9 aspect ratio and 90% screen-to-body ratio are big changes from the G5's smaller 5.3-inch screen at the usual 16x9 standard. This is hardly the first nearly bezel-free smartphone we've seen, as the Xiaomi Mi Mix launched a groundbreaking all-screen phone in China last October. The Samsung Galaxy S8 is also rumored to nearly eliminate bezels thanks to its curved screen and supposed lack of a physical home button at the bottom. 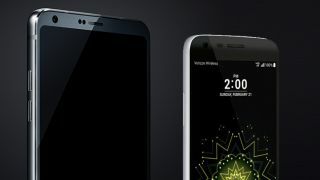 The LG G6 has the advantage of launching at MWC 2017 on February 26, before the Samsung Galaxy S8. That's when we'll see the full LG G6 revealed. Thanks to another leak, we we have a better look at the alleged LG G6 design in its entirety. While the previous leak showed the top half of the phone, a new image spotted on Weibo by GadgetDetective shows the phone in its full glory. If this new image is indeed real, it shows that the phone's bottom bezel is almost exactly the same thickness as the one at the top. However, we can't confirm whether or not the image is legitimate or whether it's a completionist's attempt to cleverly edit the original leaked image.